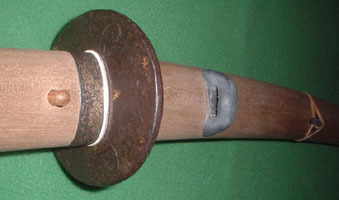 Actual examples of producing KOSHIRAE (mount of sword). We are going to make a "wakizashi koshirae" for the blade. Select the metal fittings to dress the sword. 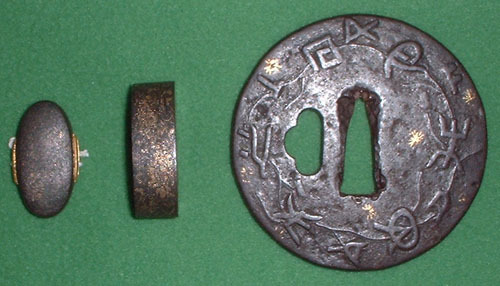 At least the tsuba, fuchi, and kashira are necessary at this stage. Bring the blade with the shirasaya and the metal fittings to the scabbard maker. We discuss the plan to make what kind of mounts. After one month, the base work of the mount is completed. 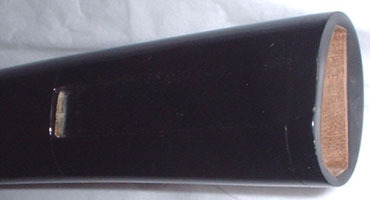 The lip of the scabbard mouth, kurikata, kaerizuno, and roof of kozuka slot are made of buffalo horn. 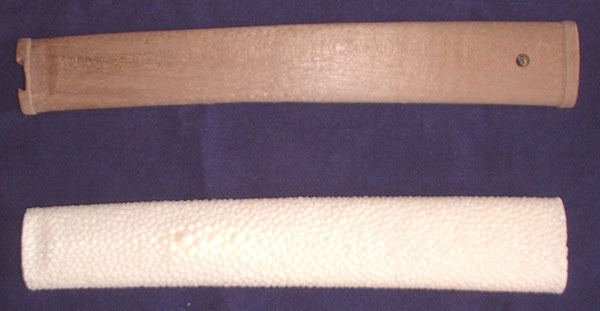 The kozuka stop is made of ivory. Then the plain wood scabbard is brought to the lacquer worker. He glues the horn fittings and paints the scabbard with urushi lacquer. After one month, the urushi lacquered scabbard is brought back. 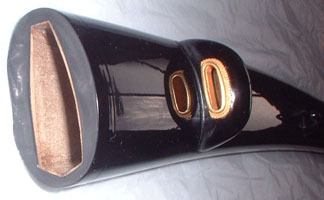 A pair of shitodome are put on the kurikata. 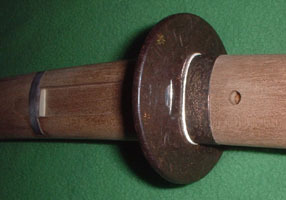 Now, the handle and the scabbard are brought to the handle worker. 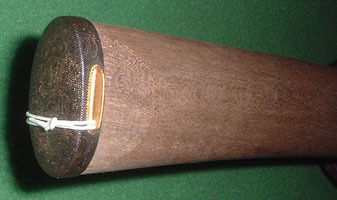 The scabbard is necessary to fix the shape of the handle that must be well matched in the whole mount. The ray skin is prepared. The centre of it is cut out for the size that accord with the handle. He shapes the wood keeping in mind the thickness of the ray skin. A ray skin doesn't have an even thickness, and it becomes soft by being wet. He temporarily wraps the wet ray onto the handle. After it becomes dry, he checks the shape and shaves the wood to get good shape. He has to take temporary wrapping again and again to fix the shape. The depressions near the kashira are to settle the knots of cord. Another depression near the fuchi is to make the top of the crossing cords down. It keeps the top of the cord away from the kozuka drawing. He glues the ray skin onto the wood handle. He then makes the hole for the pin. The menuki and cord colour is selected. He glues the kashira, and starts wrapping the ray-skinned handle with the silk cord. On the case of the menuki that has a running animal design, it has to run towards the kissaki. The opposite direction is not good, as it is called "escape menuki". All parts of mount meet together. They are worked by different craftsmen. If my directions to the craftsmen were not proper, we would find serious problem at this step. In the worst case, we have to return to the start position again. Put the sageo onto the scabbard. The wakizashi koshirae is completed. It takes about 4 or 5 months from the planing to the completion. Then we should find a suitable kozuka for this wakizashi. Finally we have found a kozuka that the motif accords with other fittings. 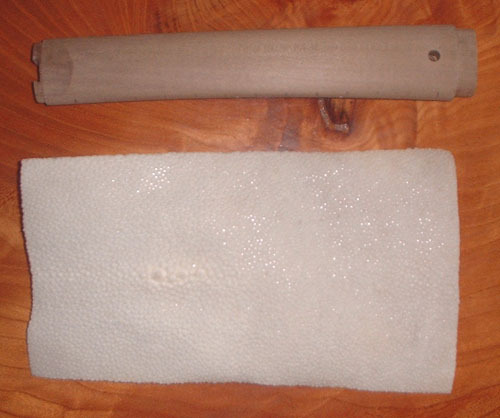 A blade for it is prepared, and the tang of it is fixed with the kozuka by pine resin. Anyhow, for producing mounts, a good director is necessary. A knowledgeable person should keep watching every process of the works keeping in mind a vision of the completed mount. A good mount is not promised even if every craftsman is good. To arrange a craftsmen's network is very important for producing Koshirae.